New Zealand has confirmed that the black, white and blue silver fern design won a referendum to become a possible new flag, after the final votes were counted. A second referendum will be held in March to decide whether to adopt the new flag or keep the current one. The design was named as a preliminary winner on Friday but this final tally factors in late and overseas votes. A similar design in red and blue came in a close second. Both flags were designed by architect Kyle Lockwood. About 1.5 million votes were cast in the referendum, with a voter turnout of 49%, said New Zealand's election commission. What do schoolchildren think of the new designs? Still in third place is Red Peak, a design that was popular on social media and was added to the ballot following an online lobbying campaign. The winning design, known officially as Silver Fern (Black, White and Blue), happens to be Prime Minister John Key's pick, and he had earlier expressed delight that it had won in the preliminary tally. New Zealanders were asked to choose which of five designs they preferred. The referendum has divided opinion in New Zealand over its cost and timing. The entire exercise is expected to cost around NZ$27m (£12m, $18m). Many also took issue with the final five flags on the ballot, saying they were largely uninspiring. The decision to choose a new flag has been backed by Mr Key, who has said the current one is too similar to Australia's and that it is time to remove the Union Jack from the current flag. 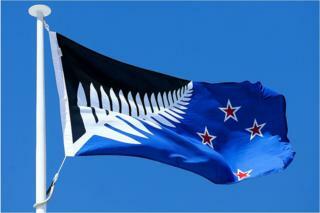 How should New Zealand choose a new flag?